Woo hoo! it’s Thursday again and we have another FABULOUS challenge for you for the Create with Connie and Mary Thursday Challenge. This week we have a cool color challenge for you – Perfect Plum, Mint Macaron, and Sahara Sand and since I’m on a Wild About Flowers ‘kick’ lately, I thought this color combo would be PERFECT for it! Neutrals dsp – Sahara Sand diagonal print – 1 1/2 x 4 1/4, add to card front. Whisper White – 3 x 2 3/4 and 3 x 3/4. On the larger piece, stamp stem using Mint Macaron, flowers using Perfect Plum, and greeting using Sahara Sand. 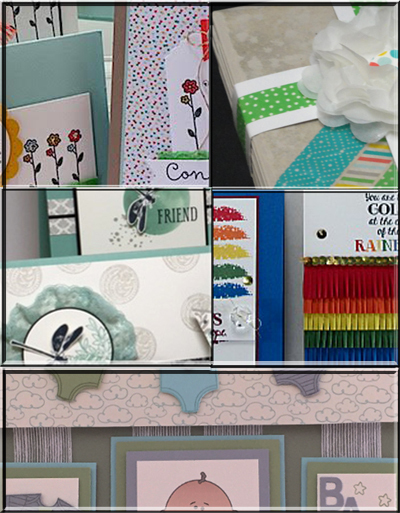 Round bottom right corner and add to card front using dimensionals. Round bottom left corner of narrow piece and add using dimensionals. Tie Whisper White Bakers Twine in Sahara Sand and Perfect Plum buttons and add to card front. Didn’t that turn out cool? I thought so! Speaking of cool…we have just released the Create with Connie and Mary July Mini Session. 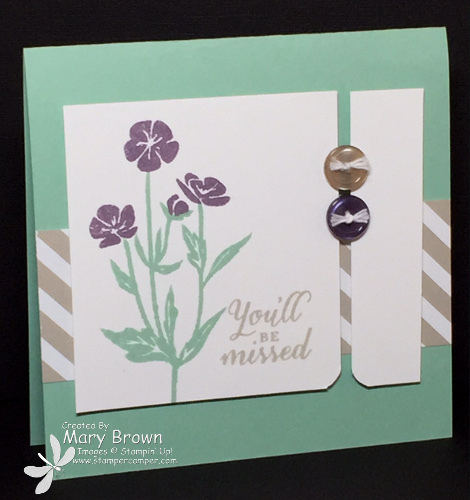 This entry was posted in Create with Connie and Mary and tagged Wild About Flowers. Bookmark the permalink. I love this super CAS card – your sketch layout with the split panels and buttons works perfectly! I am still resisting this stamp set, but only just – it’s gorgeous. Great job Mary! Love how you used these colors to create such a clean and crisp-looking card! Sweet flowers and love the stripe DSP behind the split panel! Very creative! Love the layout and the buttons but it is the rounded corners that I love best. Really pretty overall! This is a great design in that it is simple, but doesn’t come across as simple thanks to the pattern, interesting shapes and embellishments! Very lovely! I love your flower kick! You’ve outdone yourself with this one! It’s all about the details…the frayed ends on the twine, the rounded corners, the neat layout….All wonderful!